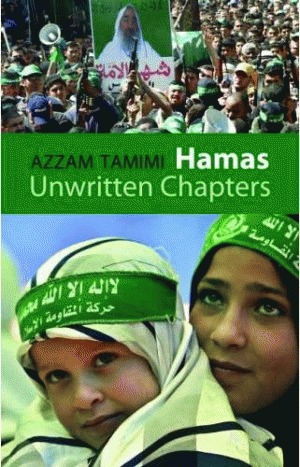 Azzam Tamimi's Hamas: The Unwritten Chapters was released in the U.K. by Hurst Publishing shortly after the collapse of a Palestinian National Unity Government that recognized the electoral victory of Hamas. Hamas: A History From Within was released in the U.S. by Olive Branch Press, an imprint of Interlink Publishing, just after Hamas seized control of the Gaza Strip through military force. A postscript was written for the U.S. publication that cannot be found in the UK. It warned that the people of the Gaza Strip, "may find no alternative but to explode in the face of a world community that had denied them democracy". In the original introduction, Tamimi described his book as a resource for, "those...who are interested in seeing an end to the conflict in the Middle East, or are working for this outcome". By the time of its release, Hamas: A History From Within had become a crucial resource for those trying to understand the next phase of an evolving war. Azzam Tamimi, a Palestinian scholar on Islamic political thought, and Middle Eastern affairs, was approached by Hurst Publishing to write about Hamas after the release of his 2nd book, Rachid Ghannouchi: A Democrat Within Islam. Dr. Tamimi, a former lecturer at the Markfield Institute of Higher Education in England, and Kyoto University, and Nagoya University in Japan, was born in Hebron in the West Bank. He spent the majority of his pre-adult life in Kuwait where he attended school with Hamas' future Political Bureau Chief Khalid Mish'al. Dr. Tamimi relocated to the UK to obtain his undergraduate and graduate degrees. He has studied extensively with members of the Ikhwan (Muslim Brotherhood), and maintains close friendships with senior leaders of Hamas. It was this expertise that Hurst, the publisher of Tamimi's 1st book Islam and Secularism in the Middle East, wanted to tap into. In 2003, the same year the EU listed the political wing of Hamas a terrorist organization, the contract was signed that brought to print in the UK a comprehensive history and analysis of Hamas from the perspective of a sympathizer. In Hamas: The Unwritten Chapters Tamimi provides a counter-balance to the sources on Hamas that rely on security and intelligence files, and are hostile to the organization's objectives. Tamimi draws from personal interviews, internal political documents, and open sources to present an intimate history of the origin, and evolution of Hamas. Through Tamimi's narrative, we learn how Hamas developed from a branch of the Muslim Brotherhood to one of the most targeted terrorist organizations in the Palestinian territories to the democratically elected representative of the Palestinian people. Hamas emerged as an armed resistance movement with the release of their Dec. 14 1987 communique' that followed the outbreak of the 1st intifada. However, Azzam Tamimi spends considerable time tracing the development of Hamas from its roots in the Ikhwan (Muslim Brotherhood) to provide a detailed description of the foundation stones to Hamas' armed uprising. Tamimi's narrative begins with a history of the Ikhwan, an international organization devoted to establishing an Islamic state in an Islamic homeland free from foreign influence, and its project in Palestine. The respect and admiration Sheikh Ahmad Yassin, Hamas' founder, commands in the Islamic world is reflected in Tamimi's very personal portrait of the spiritual and political leader. The reader travels with Yassin through the phases of his life that solidified him as an icon of purity, and justice in the Arab imagination, such as his persecution at the hands of the Egyptians, and his total rejection of material wealth and comfort. Through Yassin's devotion to the mission of the Muslim Brotherhood, and to the cause of the Palestinians, the Ikhwan blossomed in the Palestinian territories, and rejuvenated the crumbling society through real social welfare programs that improved daily life. Tamimi's narrative opens a window into the rational, and internal pressures that prompted the transition of the Palestinian Ikhwan from an organization concerned with education and institution building to an organization with the fiercest and most active force in the Palestinian resistance movement. Tamimi provides a captivating description of the early organization of the Palestinian Ikhwan's Jihad project, which took on the name Hamas in 1987, and reveals surprising information about the contribution of the Ikhwan's institutions to the 1st intifada, and the methodical preparation and planning that was involved in the spontaneous uprising. Tamimi spends considerable time tracing the evolution of Hamas through various trials that nearly destroyed the organization, such as waves of mass arrests, and targeted assassinations by Israeli security forces, and the loss of their headquarters in Kuwait, and Jordan. A rare glimpse is, also, provided into the internal crises of Hamas, which resulted in the expulsion, and defection of some members, and the official split of Hamas from the Ikhwan. Tamimi documents how Hamas responded to these challenges by adopting an organizational framework that not only allowed its military and political work to continue, but to have a major impact on the balance of power in the Middle East. The separation of Hamas' political and military branches, the decentralization, and diversity of its operations, and the geographic separation of its leadership enabled a quick recovery from any attack, and gave it the appearance of immunity to the efforts to destroy it. Ironically, we learn through Tamimi's narrative that many of the factors that allowed Hamas to not only survive, but thrive, were unintended consequences of Israeli policy. Palestinian terrorism is often attributed to Israel's occupation of the West Bank and the Gaza Strip. Tamimi teaches us that, in the case of Hamas, this is true not because of horrific conditions, but because of improved conditions, which allowed the Palestinian Ikhwan to become integral to Palestinian society. Israeli administrative control post 1967 enabled Ikhwan members to travel between the West Bank and the Gaza Strip, and conduct the education and institution building that was brutally suppressed by Egypt and Jordan during their period of control. We learn that Israel's 1992 large-scale round up and expulsion of Hamas activists to South Lebanon officially introduced the organization to Hezbollah, and international offers for military training, and logistical support. Hamas achieved widespread diplomatic recognition, due, in part, to the Mossad's botched attempt to assassinate Political Bureau Chief Khalid Mish'al on Jordanian soil. The political crisis this created resulted in Israel's release of Sheikh Yassin from prison. The international tour Yassin immediately embarked on generated an outpouring of popular support, and established Hamas as a prominent diplomatic player in the Middle East. Rather than having a negative effect, the loss of Hamas' headquarters in Jordan, due to peace negotiations with Israel, enabled Hamas to establish diplomatic outposts throughout the Arab world. In addition to a comprehensive history, Tamimi provides an in-depth analysis of the ideology of Hamas, and does not shy away from discussion of controversial topics, such as Hamas' martyrdom operations. Tamimi presents a balanced introduction to the debate that exists in Islamic thought over whether suicide bombers qualify as martyrs. Tamimi, also, documents the evolution of Hamas' expression of their struggle, which has become more sophisticated as their audience has expanded from the Arab to the western world. He, also, provides special insight into Hamas' efforts to revise their 1988 Charter to minimize religious terminology, and highlight the political aspects of their struggle. Tamimi, also, presents the challenges involved in brokering a peace agreement between Hamas and Israel. Hamas' popular support can be linked to their categorical rejection of the peace agreements endorsed by the Palestinian Liberation Organization, and its refusal to recognize Israel's right to exist. However, Hamas' electoral victory in the Palestinian National Council placed it in direct diplomatic contact with Israel, and Tamimi captures the dilemma involved in Hamas entering into diplomatic negotiations with Israel without compromising their previous position. Tamimi, however, distinguishes between a true peace, a long-term truce, or Hudna, and a temporary cease-fire, or tahdi'ah, in Hamas' ideology, and documents Hamas' requirements for a Hudna with Israel. Azzam Tamimi's book was published at a time when Hamas was struggling for recognition of its political legitimacy, both inside the Palestinian territories, and on the world stage. Alastair Crooke, a former MI6 officer, and security adviser to the EU envoy sent to Israel/Palestine to promote peace negotiations, criticized U.S. policy towards Hamas in his forward to Dr. Tamimi's book, which, he claims, is based on a misunderstanding of moderate Islamist movements. He wrote that Dr. Tamimi's book would help challenge the west to reshape its perception of, and attitude towards Hamas. However, despite his outspoken sympathy for Hamas, Azzam Tamimi applied a great deal of academic rigor to his work, and was honest in his portrait of the political vision, and history of the movement, which many would not see as moderate. Tamimi did not delve into Hamas' connection to Iran, or the international terrorist network, however, he, also, did not sugarcoat Hamas' military activity, or attitude towards the Jewish state. Azzam Tamimi's Hamas: A History From Within is rare in that it is supportive of Hamas, yet, it will be appreciated by anyone concerned with the Palestinian-Israeli conflict, due to the incredible insight it provides. In an e-mail communication, Azzam Tamimi wrote, "Neutrality and 'objectivity' in literary works are myths. We humans have our own biases. But what really matters is that these sympathies and biases should not be expressed in terms of 'not telling the truth' or in terms of 'telling lies'." Dr. Tamimi was true to these words in his history, and analysis of Hamas. Who Are the Citizens for a Legitimate Government?